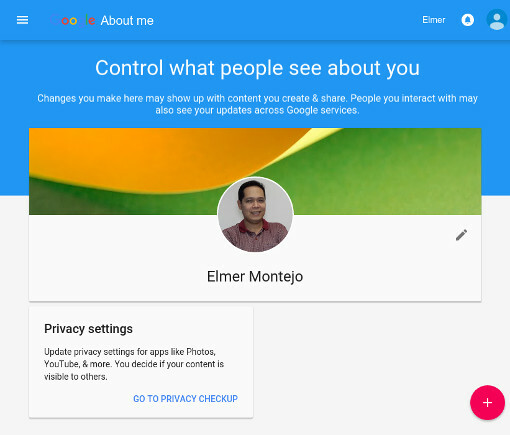 Google has begun rolling out a new About Me tool this week that gives you more control over what personal information is publicly displayed by various Google services. So now you have one place to control of your privacy across Gmail, YouTube, Google+, Hangouts, Google Play, Inbox, Maps and more. When you share personal information with any Google service, Google shares it with other users, who may see it in searches and interactions with others. The new About Me tool lets you view, edit and remove your personal information if you've changed your mind about how much you'd like to share. To use its services, Google requires at least a first name, photo and birthday. Google uses your first name and photo to identify you across its services and set you apart from other users. It requires your birthday in order to verify your age (you can hide your year of birth from other users); the date is also used for account recovery in case you forget your log-in details. If you’ve signed up for Google+, you’ll recognize these details from your Google+ profile. Google no longer requires you to sign up for Google+ in order to use other Google services. If you do have a Google+ account, changes you make to either your About Me page or your Google+ profile will be reflected in the other. The About Me page lets you add, edit or remove work and personal contact information (such as phone number, residential or office address, email), educational information, work information (previous employment, current employment, including locations), places you’ve been (such as where you currently live, where you previously lived or where you visited) and your online presence (other social media accounts and websites). To add details, click on the red plus button at the lower right corner of the page. For the time being, you can’t specify what information you’d like to share to a specific service. To access your About Me page, go to https://aboutme.google.com. Controlling your privacy online can be challenging, but features like Google's About Me page make it easier to prevent sharing personal information more widely than you intended. Stay up to date with the latest advice on protecting your personal data with our coverage of how to protect your privacy.